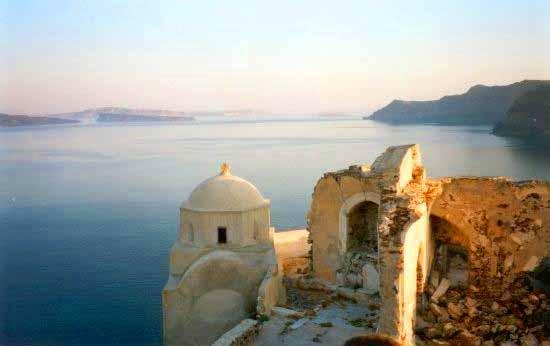 In May 2000 I visited the beautiful volcanic island of Santorini. I took my parents along for this trip and we had a direct flight from Finland. I have though, heard from many people since, that you see the best of this island if you visit by boat. Even so we saw a large part of the island from land-based trips during our weeks stay. 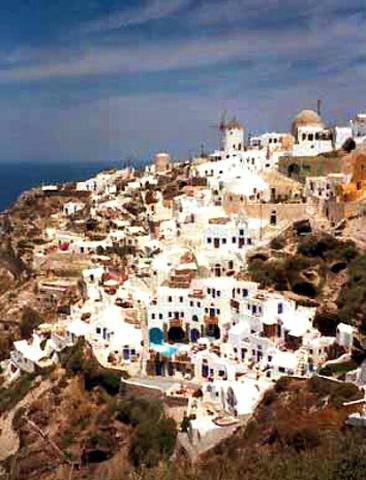 The scenery was magnificent; totally different from any that I have seen on other Greek Islands either before or since. I was amazed by the way people had built their houses on the cliffs as if they were just hanging there. On the caldera side you could still see the sediments of volcanic stone and it wasn't too hard to picture what the landscape had been like before the great eruption. There are not too many roads by the caldera and especially going down. 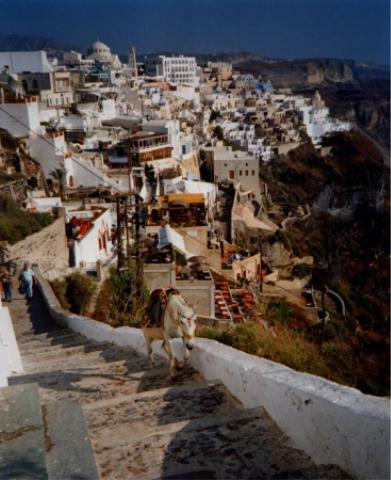 You can get down to Fira, the main port of Santorini by car, you can descend by one of the many stairways on foot or have a donkey, the most traditional transport in Greece. 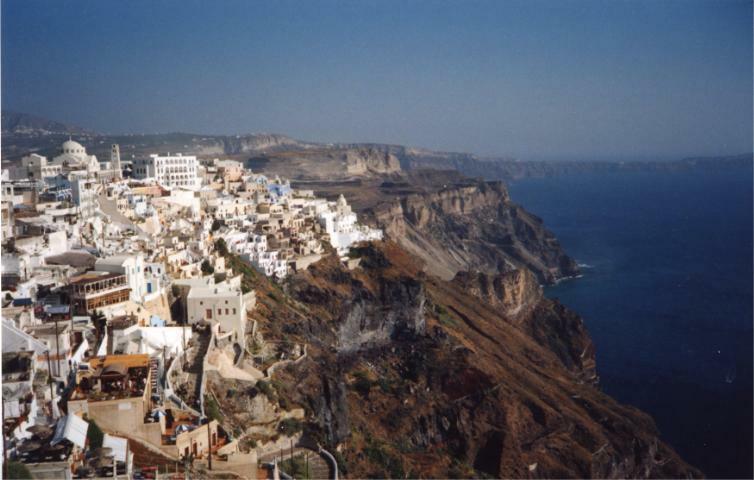 We visited Fira many times and we also tried the cable car for the return trip. We walked down to the harbour, since it was so hot and it's always easier going down than coming up. Walking was fine but the stairs may be slippery, and you have to share the stairs with the donkeys. 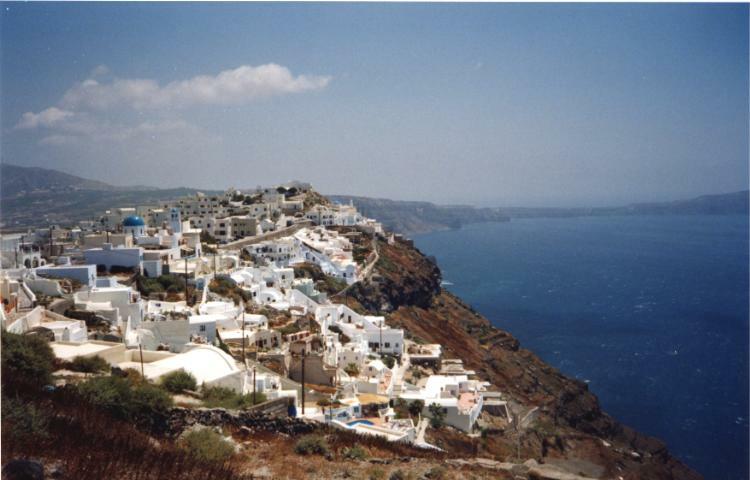 Our hotel was in the small village of Oia on the northern tip of the island. There weren't too many roads but the narrow alleys going up and down right next to the houses and courts were adorable. The village and its alleys were like a big puzzle. It was fascinating to see how bright were the colours of the houses, so blue, so white and the view was fantastic. 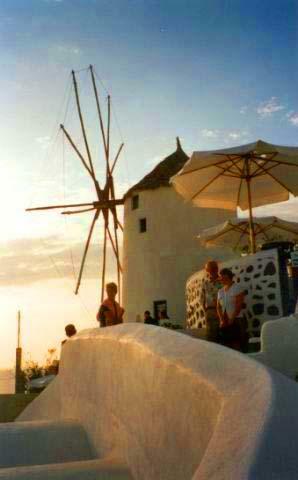 It is said that one of the most beautiful sun sets in the whole of Greece can be seen at Oia, Santorini and I do agree. There were bus loads of people coming from other villages just to see the sun set. 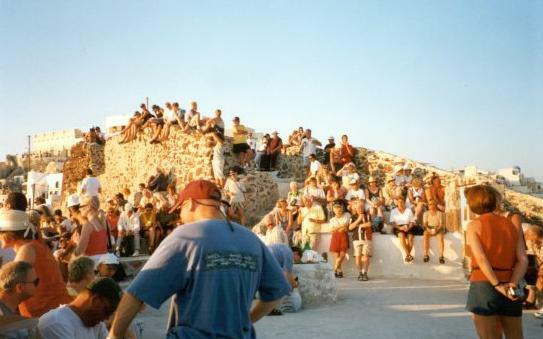 The terrace as well as the slopes of Oia were crowded when the evening came and the sun began to set. 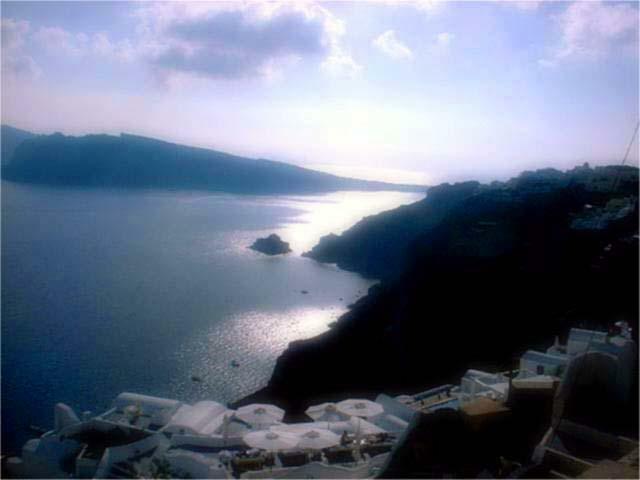 It is I think the best view that I found on Santorini. Caldera is like a lake and it covers a huge area of what used to be the crater. There are small islands in the Caldera, Palea and Nea Kameni, and they are still volcanically active. You can take a boat trip to these islands but the smell of sulphur can be disgusting. Boats will take you also to the Aspronisi, the White Island, which is far better.